The life of a Public Relations expert is sometimes frustrating – especially when it comes to the titles of press releases – oftentimes clients do not understand that in order to convert readers into buyers that articles (especially titles) need to offer some form of a benefit. Traditionally clients want to see their names in the titles of articles – this seems to give them some form of satisfaction at the expense of conversions. 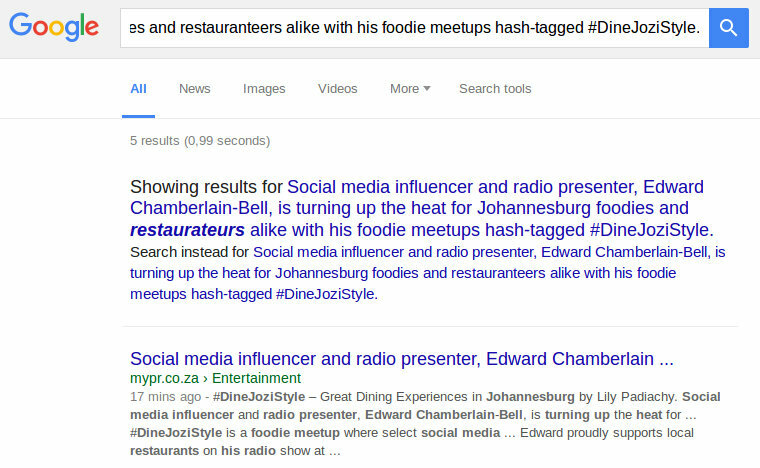 With reference to this recent Article Title submitted to MyPR: Social media influencer and radio presenter, Edward Chamberlain-Bell, is turning up the heat for Johannesburg foodies and restauranteers alike with his foodie meetups hash-tagged #DineJoziStyle *. If one looks at the Google Result displayed you will see that only a small set of the title is displayed: Social media influencer and radio presenter, Edward Chamberlain … – to be precise a total of 67 characters (with spaces) is displayed. Why is this a big deal you may ask? We at www.MyPR.co.za recommend that you keep your title to 65 characters in length and concentrate on titles that invite people to read more by posing questions, offering solutions, piquing curiosity and creating a sense of urgency. Take the title of this article: Easy rules to creating great titles that will be read every time – it is in the optimum length of 64 characters (with spaces); it offers a benefit/recipe (easy rules to), invokes curiosity (creating great titles) and an outcome (that will be read every time).